ENYYSA Members receive special discounted pricing when they mention the ENYYSA Discount and place order 90 or more days in advance of delivery date. Please contact Jon Bivens at 1-800-949-7467 ext 2211 or jonbivens@sportpins.com and mention the ENYYSA Early Order Discount. Special Tournament Discount Packages Are Also Available. SPi is your "One-Stop" Award Headquarters. Order everything you need from one convenient supplier. FREE COMPUTER Graphics. Ordering from SPi will give your awards a unified professional look. SPI produces only the highest quality recognition and awards products. No one beats our quality! SPi representatives are SOCCER knowledgeable and will help you select an award package to meet the needs of your individual event. 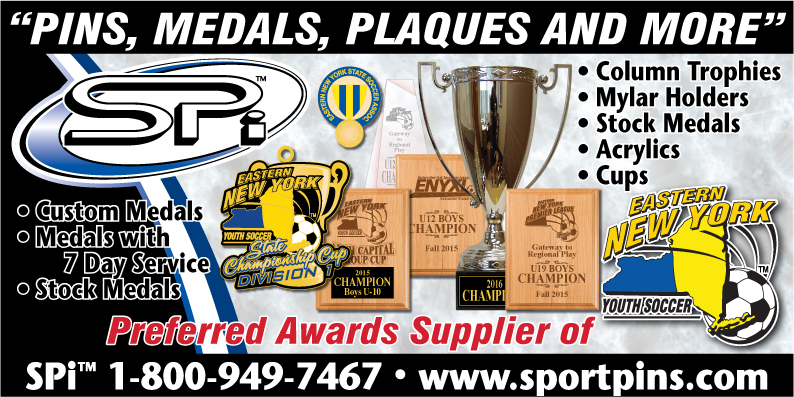 The Eastern New York Youth Soccer Association (ENYYSA) has announced Sport Pins International Inc.(SPi) as its Preferred Awards Supplier. Under the terms of the partnership, Sport Pins International will provide medals, pins and coins for Eastern New York programs, including the State Cup, Presidents Cup and the Kohl’s American Cup. Founded by Connie Bivens in 1980 and based in Upland, California, Sport Pins International has offered its customers the finest quality awards in the industry for more than 30 years. Sport Pins offers a full range of award and recognition products including pins, medals, coins, bag tags, plaques, trophies and a number of additional customizable products. For more info on the Eastern New York Youth Soccer Association, log on to http://www.enysoccer.com. For more information on Sport Pins International, please visit http://www.sportpins.com.